Will you really get the Best Deal for Bulky Waste from your local council? It pays to check other options for bulky waste collection. Back in 2014, many local councils introduced fees for collecting bulky waste, those items such as fridges, freezers, beds and mattresses. As a means of cutting their own costs, many councils felt that fee payments were a good idea but this was a view opposed by many. Opposition has proved right, and fly-tipping has risen massively since. Increased fly tipping is now fact, and done by illegal waste collectors, and sometimes by less-than-responsible families, who might not want to (or be able to) afford the cost of having their bulky waste removed legally by a licensed waste transporter. Always, make sure you employ a licensed waste transport company. Don’t pay good money and later find your waste tipped on a local verge! 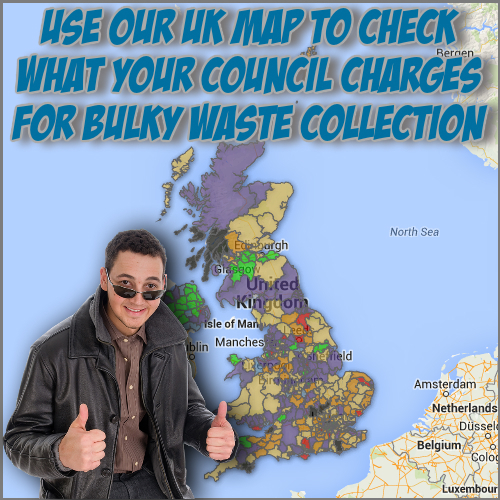 See the map below to find out how much bulky waste collection costs where you are. Scroll on down for comparison prices for bulky waste collection charges. Data notes: Prices are a minimum charge and may cover more than one item. The cost is for standard non-electrical and non-reusable bulky good. Prices are for local residents and do not include discounts or concessions. Map courtesy of Collect Your Old Bed. Many councils who were already charging for bulky waste collection took the opportunity to raise their charges whilst councils which had previously offered a free collection, such as Luton Council, introduced charges of £25 for up to three items. With considerable weight behind the initiative meaning fee-based collection services rapidly becoming the norm since April 2014, an interesting period has followed which has seen the range of costs charged by councils across the UK vary considerably, from charges of £13.50 for 5 items (Walsall) to a hefty £50 for 3 items in Eastbourne (although Eastbourne council stresses that this larger fee subsidises a free service for local pensioners) and a significant £75 for 3 items from Buckingham council. So how are local councils shaping up when it comes to being competitive when dealing with bulky waste collection? Understandably, costs do vary within localities. Inner city councils, for example, which have high residential and commercial density, may offer more affordable local services because the distances they need to cover are shorter, although many have to factor in the cost of transporting waste goods to recycling or council run tipping sites on city fringes for disposal. Councils which cover more rural areas may seem to charge more due to the distances involved. Some local councils have held out in the fight to be fee-free, but with their own costs rapidly rising whilst budgets diminish, 2015 seems to be the year for most remaining councils to add a charge to their service. With commercial services also available in most areas, many councils may no longer be offering the best deal for bulky waste. As one of the last Welsh councils to introduce a fee, Vale of Glamorgan Council will be charging £15 for collection of up to 3 bulky waste items beginning from April 2015. Nevertheless, like Eastbourne council, it includes concessionary rates for households which are less able to pay. So, always look out for local council concessionary rates which may mean your local council will still be cheapest for you. However, although many households now paying to have their bulky items removed may feel that they are disposing of their bulky waste items such as beds and mattresses responsibly. In truth many of the items picked up by council services end up in landfill where they languish as environmentally hazardous waste. When it’s also considered than many local councils and public services such as prisons and hospitals may be responsible for disposing of thousands of beds and mattresses each year, the prospects for landfill remains a bleak one. The best deal for bulky waste is to engage a collection service which has a great green recycling policy. Paid services which offer responsible and 100% recycling of bulky waste items offer a more cost-effective option when it comes to disposal, when the cost to the planet as well as householders is considered. So, if it comes to choosing the”best deal” for bulky waste, it’s not just the amount of items to be collected for the fee which should be considered, but also what happens to the waste once it’s been collected. Although many more local councils such as the London Borough of Lewisham are now opening and making better use of recycling centres to help ensure that bulky waste is dealt with responsibly, in many cases it’s private companies such as Collect Your Old Bed which can guarantee that items such as beds and mattresses end up as recycled items rather than as refuse. Whilst there’s considerable weight behind the ongoing principle of paid-for bulky waste removal, finding the best deal should be considered in terms of ensuring that all costs. These costs include the cost overall, when the costs to local environments, are accounted for. This means that only those councils or private services offering green credentials, fully transparent operating systems, and 100% recycling once collection has been made, are truly “green”. Only such organisations can represent the best deal in making bulky waste collection arrangements, and are really worth the cost.